The moon snails are living, feeding, and breeding like crazy here on the coast of Maine. I just was out doing some beach collecting today when I found this fist-sized snail half buried in a sandy stretch of clam flats. Moon snails are molluscs that are predatory as opposed to being filter feeders, grazers, or scavengers. Their scientific name is Lunatia heros. At this time of year, you will find the snails and not too far away in the mud will often lie their large 'sand-collar' egg cases. Just this one beach today had in my estimation at least 3 of these egg cases per square meter of the exposed beach! One day we decided to see how many sand collars we could find and very easily filled two 5 gallon pails of them in an hour. Periwinkle snails, dog whelks, and even other moon snails. They are CANNIBALS - which means they eat each other too. Here are some snails I found eating other moon snails. 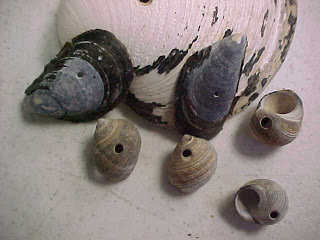 Moon snail feeding holes in mussel and periwinkle shells. To find moon snails at low tide you have to look for their 'push ups' - a small mound or burrow type mark in the beach sand or clam flat mud. Years ago I always thought that this was the sign of a raccoon feeding on the clam flats. One day I decided to take a dig down into one of these and low and behold - there was the slimy, juicy foot of a very large moon snail. Once disturbed they quickly retract into their shells and pull their operculum shut behind them. 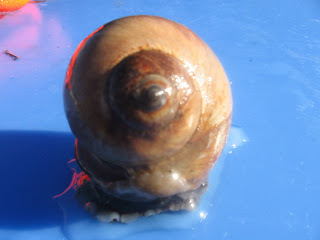 What happens on the flats is that as the tide recedes, the moon snails eventually become stranded by the ebbing water. Once exposed, they could be preyed upon by seagulls or perhaps get too hot in the sun or dry out. At this point, they use their muscular foot to dig into the sand. This leaves behind a lump in the sand or a bump in the mud. Follow the bumps or lumps and you will find moon snails - it is that easy. Moon snails make good aquarium specimens. They do feed on an occasional mollusc, but they are also very beautiful to watch as they glide along on their exposed mantle and foot. We keep many moon snails in our tanks for just this purpose.